This post was requested by @cditman. If you would like something explaining or have an questions please contact me either on Twitter, Facebook or email – thewptformula@gmail.com. Cheers! As of the start of the 2014 season, teams must nominate all 8 forward ratios (plus reverse) before the opening round. 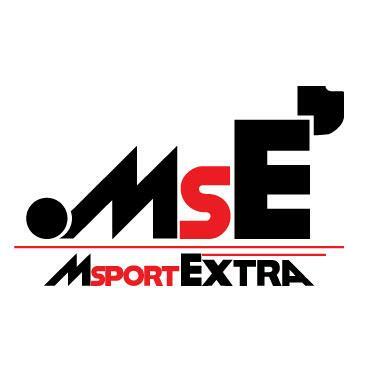 They then have only one opportunity, should they be willing to take it, to change their ratios during the season. That’s it. No bespoke gearing for each track and no free-spirited changing during a Grand Prix weekend. Given all the computer, dyno and simulation technology at the F1 teams’ disposal, it’s quite amazing how varied the ratio selection is across the grid. There are some positive and negatives for each solution, but is there an optimum setup? At the midway point in the season, I’m going to attempt to dissect some of the teams’ gear ratio choices and why, surprisingly, they have not converged to one solution. For simplicity purposes I’m going with opposite ends of the gear ratio selection spectrum: Williams and Mercedes. To demonstrate the differences between the two, I have linked two YouTube videos below showing exactly the same lap of Melbourne from each car onboard. Once you have watched both we will continue! We need to give these laps a little bit of context, however. Lewis Hamilton’s lap was the fastest lap during FP2 on the option tyre whereas Felipe Massa’s lap was during FP3 on the prime tyre. We are assuming that gear selection for both laps would have been what the driver would normally use in a qualifying situation although Massa may have had a little more problem getting the power down a little on corner exit due to the harder tyre. We must also consider that Mercedes were still hiding their true pace at this stage of the season and the slight understeer (more fuel) and less aggressive steering motion of Hamilton suggests that he was taking it a little easier. All in all, though, the gears used by each driver is probably representative. 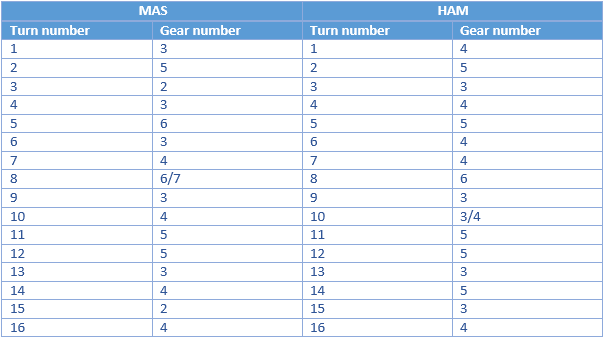 Getting hold of specific onboard footage is quite difficult (thanks FOM…) and unfortunately the above clips didn’t have the speedo/gear number graphic, so I’ve written a table with the gear number at each corner for both Massa’s (MAS) Williams and Hamilton’s (HAM) Mercedes. We will use the official track map as a corner indicator. You will notice that Hamilton tends to take higher gears in the slower corners than Massa (Hamilton never uses 2nd gear) although they are pretty similar in the high speed corners. Massa was also short shifting a lot on corner exit to control the torque whereas Hamilton was doing less of this as he was already in a higher gear. Massa easily hits 8th (top) gear but Hamilton is only just above midway through the rev range in 7th gear at best. Traditionally, taking a lower gear into a corner allows the driver to control his apex speed better and then get maximum acceleration on exit. Short shifting into the next gear on exit prevents slip whilst maintaining good drive. During the naturally aspirated engine era this strategy worked well as most of the torque was delivered at the top of the rev range and short shifting cut power delivery quite a bit. For 2014 this is not so clear cut. There is a hint of turbo lag in this year’s power units due to the massive turbines (low moment of inertia) and a small capacity Internal Combustion Engine (ICE) being used. Reducing the length of exhaust and charge air cooling pipework help reduce lag but the use of the two MGUs have virtually eliminated it. 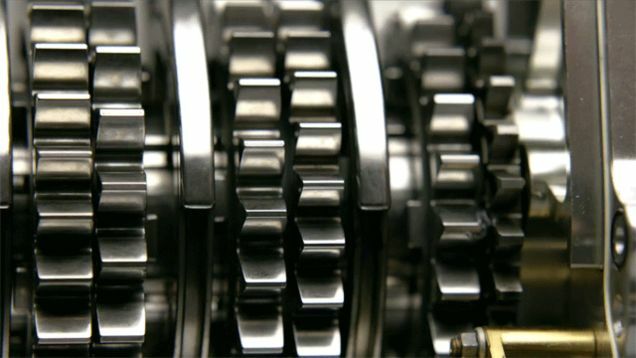 This is what some teams like to call “torque fill” – the gap where a relatively low torque output occurred is now filled by either the MGU-K driving the crankshaft or the MGU-H artificially spooling the turbo and getting compressed air into the engine sooner, or even both at the same time. The engine mapping technicians can work with these two parameters – and cylinder cutting – to create the best driveability from the power unit, but it’s still a challenge for the driver. This means that torque – as much as 3 times greater than years gone by – is pretty much available as soon as the driver picks up the throttle. As a result, short shifting is almost negligible in effect and this is why Williams struggled early in the season with rear tyre degradation. However this has since improved so there must have been improvements in the power unit software to ease the rear tyre slip. Williams are clearly running shorter ratios than Mercedes – much shorter. The Mercedes doesn’t even hit 8th gear – only once has a Mercedes car hit 8th gear and, if I remember correctly, it was Nico Rosberg passing another car with DRS and a slipstream in China along the massive back straight. And he only just engaged it before braking! There are a few advantages to shorter ratios though. If you haven’t noticed already, both Williams drivers tend to have bloody good starts! Quickly changing through the gears is an easier way of managing the vast torque output and this works particularly well in a straight line. Not only is the FW36 good at accelerating, but the car’s engine mapping is such that it maintains a peak torque output across a lot of the top end ratios which is why it is so quick in a straight line. However this is also aided by their car’s low drag aerodynamic design, whether that was an intentional feature or not is unclear. When it comes to corners, however, the shorter ratios are not ideal, particularly during medium and high speed corners. Let’s cast our minds back to Bahrain when both McLarens retired during the race. This was due to a clutch problem although they didn’t specify what it was. At the time it seemed strange because normally a clutch issue would come during the start of the race or at a pitstop but the problem caused both cars to stop in the middle of the race. Both drivers had complained of an unstable car during the high speed corners, especially on upshift and downshift. Bahrain has a lot of corners where the driver is accelerating or decelerating and turning simultaneously. The modern sequential gearbox is a ruthless piece of kit and shifting, up or down, puts a lot of load through the rear of the car. To counter the problem, McLaren decided to disengage the clutch ever-so-slightly on each shift to damp the rear driveshafts and prevent the rear from misbehaving. With a sequential ‘box, the clutch is only used if the driver needs to pull away from a standstill and the clutch unit itself is tiny. The extra strain put on the clutch during each shift eventually caused it to fail. If you’re changing gears a lot during long corners then this can play havoc with the car’s handling. Take Turn 10 as an example: the driver is turning left slightly and braking into a very slow corner so they are loading up the front right tyre quite a lot. The driver needs to be so careful both braking and downshifting to prevent the unloaded front left tyre from locking and the rev match on the downshift needs to be consistent enough to allow the driver to do so with confidence. McLarens ratios, whilst not as short as Williams, are still shorter than the Mercedes and this caused them some problems. Unless you have got your software in check, shorter ratios can bring up problems like this. Interestingly, McLaren opted to use their one allocated ratio change from the German GP onwards and I believe they have gone for longer gears. Longer ratios, on the other hand, are probably the way to go because they are, overall, more advantageous. As mentioned above, high torque output is available right across the rev range except above 12,500rpm – when the fuel flow limit kicks in. Because of this the Mercedes cars are still able to reach the outrageous top speeds this year despite not using 8th gear, whilst still having an advantage in the corners. According to rumours the W05 could well hit 8th gear in Monza with DRS – think of how fast they will be going! We will probably be moving into speeds unknown to F1 at tracks such as Spa and Monza, maybe reaching, or even extending over, 220mph. Maybe. It makes you wonder if teams will bother bringing a low downforce package to Monza or not but we shall wait and see. Looking at the whole field, every car other than the W05 is hitting top gear. Generally all Ferrari powered cars (Ferrari, Marussia and Sauber) are geared shorted than the Renault powered cars (Red Bull, Lotus, Toro Rosso and Caterham), and the YouTube videos below demonstrate this. Daniel Ricciardo’s Red Bull pulls 8th gear some 50 metres further down the main straight than Kimi Raikkonen’s Ferrari. As discussed above, it is probably advantageous to have longer gears so this is probably helping the Renault powered cars in some respects and is helping Red Bull in particular to maximise its strong chassis characteristics. This entry was posted in Analysis and tagged 2014, 8, eight, gear, long, mercedes, ratio, selection, short, williams on August 5, 2014 by thewptformula. The W05 hasn’t used top gear, and it’s 4 tenths a lap faster anyway ! Eeek !